The place was the Standin’ on the Corner Park. It pays homage to the Jackson Brown/Glenn Frey song “Take It Easy.” The Eagles’ first single was released nearly 45-years ago on May 1, 1972. It would go on in July to peak at #12 on the Billboard charts. 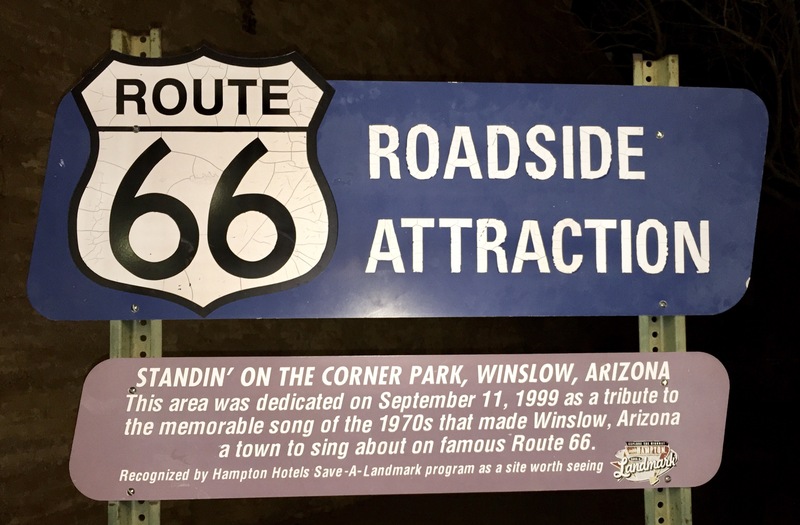 It’s been a long time, since I’ve heard the words, Winslow, Arizona, without thinking of that song. It resonates for me. Like one of those occasional signature songs, we all have in our lives. The ones that flood our mind with deep-rooted memories of days gone-by. People. Places. Events and milestones. All frozen in time and place. For me the memories include my first months at Vandenberg Air Force Base. New-found freedom! A brand new car. California! The central coast. Beautiful spring days. The aroma of flower fields that stretched for miles. And especially a California girl with whom, for a time and season, we shared love and our young lives together. 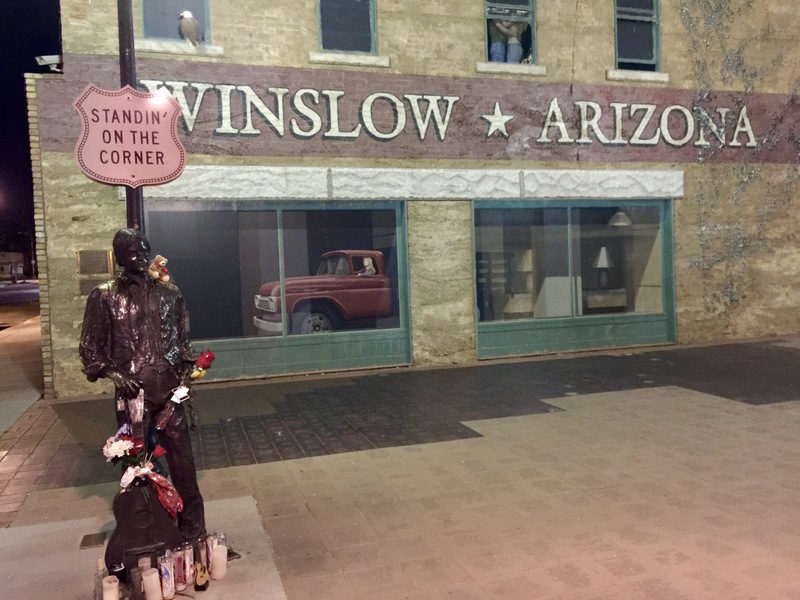 Well, I’m a standing on a corner in Winslow, Arizona and such a fine sight to see. It’s a girl, my Lord, in a flatbed Ford slowin’ down to take a look at me. So there I was… standin’ on that corner along the famous Route 66 in this little southwestern town. The late night April weather was perfect. I had the entire scene all to myself, not a single soul in sight! Winslow at that hour was a ghost town. Amid the concrete park stands a statue of Jackson Brown, with a guitar at his side. On the building behind is a large mural and parked at the curb, just feet away, a pristine, flatbed Ford. I took a few photos, some of them seen here. In half an hour or less I was back on the Interstate. I was impressed how well the city had created this appropriate tribute. Kudos to you Winslow! As I headed east, listening of course to the Eagles, with midnight approaching, I thought… how grateful I was I’d taken the time to stop. It turned out to be not only a choice, memorable experience but… an emotional one as well. I’m sure most will wonder how that might be… except maybe for those who experienced similar life-changes during those days in the spring and summer of 1972. I’d never heard this song (or at least I don’t remember ever hearing it) until just now… so thanks for including the link in your post. Also, I truly enjoyed your story about your detour. I’ve always wanted to take a US roadtrip.